Quark - Slytherin. He is highly competitive and underhanded in his business dealings, and quite clever as well as manipulative. He is willing to do absolutely anything for a bar of सोना pressed latinum. 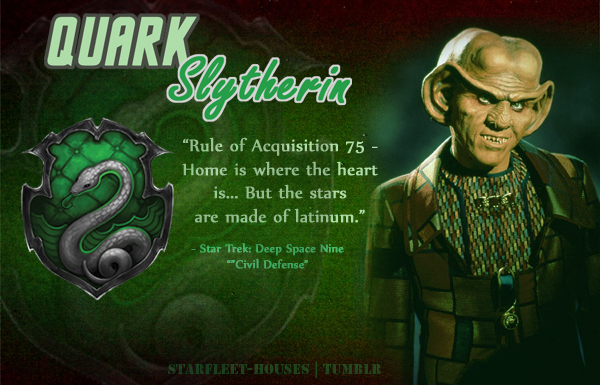 Wallpaper and background images in the तारा, स्टार Trek: Deep अंतरिक्ष Nine club tagged: deep space nine star trek ds9 quark armin shimerman ferengi treek meets hogwarts. This तारा, स्टार Trek: Deep अंतरिक्ष Nine fan art might contain संगीत कार्यक्रम, हस्ताक्षर, पोस्टर, पाठ, चॉकबोर्ड, साइन, साइन इन करें, मोबाइल फोनों के लिए, हास्य पुस्तक, मंगा, कार्टून, एनीमे, कॉमिक बुक, and manga.